The Nordic Countries include Denmark, Norway, Sweden, Finland and Iceland. They share a deep cultural and environmental background. The Nordic countries today are known for their modern sophistication in design and life style. The Viking heritage from the Eighth to the Eleventh Centuries forms a common cultural basis for today's Nordic Culture. 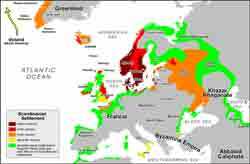 During that period the Vikings dominated the world from North America to Iran and from italy to Greenland. The Vikings were certainly warriors, but they were farmers as well settling as well as raiding. The Viking history is well worth studying to understand the world today. The Nordic peoples of Viking and pre-Viking times had an extensive and complex religion. While most students are aware of the Gods of Greece and Rome, far fewer are aware of the Gods of the Nordic people: Oden, Thor, Freyja, Balder, Loki and more. The scriptural Edda's, the Icelandic Sagas and the amazing Finish epic, Kalevala are an amazing fund of literature. Hans Christian Anderson and Asbjoernsen & Moe collected our favorite folk tales. Strindberg and Ibsen defined theater. Sigrid Undset won the Nobel Prize in literature. And Astrid Lindgren gave us Peppi Longstockings. The Swedish scientist Linnaeus gave us the language of biodiversity. Bergman revolutionized film. The important story of Nordic culture goes on and on.